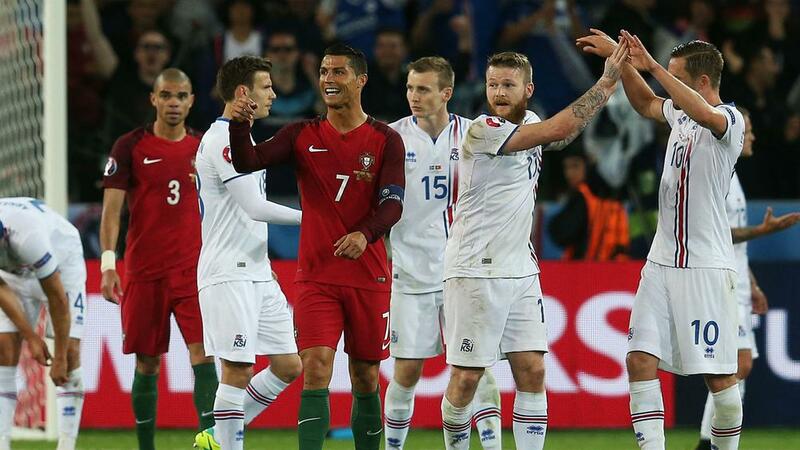 Johann Gudmundsson hopes Iceland can keep a lid on Lionel Messi in their World Cup opener, after provoking the ire of Cristiano Ronaldo at UEFA EURO 2016. In its maiden appearance at a major international tournament two years ago, Iceland earned a 1-1 draw from a clash with Ronaldo's eventual champion, drawing a frustrated response from the Real Madrid superstar. Ronaldo criticised his opponent's defensive tactics and dismissed its approach as one of a team with a "small mentality". Now preparing for its first World Cup, Iceland faces Argentina and Messi, Ronaldo's long-time rival in the quest to be recognised as the greatest player on the planet. Gudmundsson and his team-mates take on Jorge Sampaoli's men in their Group D opener, and the Burnley winger is calling on memories of Ronaldo's tantrum as inspiration ahead of a meeting with Messi. "He was obviously p***** off because they couldn't score a second against us," Gudmundsson said. "It was our first game in a major tournament and they couldn't beat Iceland so it was not nice for them. He's a winner so he got a bit angry. "It will be tough to play against him [Messi] but as long as he is frustrated and can't score, we're happy. Let's just go out there and try to beat them and make him even more angry [than Ronaldo was]. "When the draw was made I said I wanted Brazil or Argentina and we got one of them. In the first game in the Euros we played Ronaldo and now it's Messi. We kept Ronaldo quite quiet so hopefully will do the same with Messi. "We know we're probably going to be defending a lot of the time and Messi can turn it on but we just have to see where it takes us. "Attacking wise they're one of best in tournament but they have a few in defence who are maybe not at the highest level like their attackers so hopefully we use that to our advantage. "This is going to be bigger than the Euros but I think we will know more what's going to happen now that we didn't know in France. I think that will help us a bit." After facing Argentina, Iceland plays Nigeria and Croatia.